There is epidemic happening across the country and no one is safe. It’s occurring on crowded city sidewalks and spacious country walking trails. It doesn’t discriminate based on race, age, or economic status. Innocent dogs and their owners are being terrorized, chased down the street, pinned into corners by…other dog owners. But, you ask, don’t all dogs like to meet, greet, and play with other dogs, even unfamiliar ones? How rude of them not to greet me and my dog! Not so, kind hearted dog lovers, not so at all. In every city, town, and suburb, loving, law abiding families share their lives with dogs that, for a variety of reasons, cannot or would rather not, socialize with other dogs. To keep it simple, these dogs and their owners shall be known as Dogs in Need of Space (DINOS™). These DINOS have every right to walk the streets, using a standard 4-6 foot leash, without interacting with strangers, human or canine. And yet…they are hounded, day after day, by cheery, well meaning dog owners who insist on meeting them. Despite frantic efforts to cross the street or hiding between parked cars, DINOS are chased down by other people walking dogs, who refuse to believe that there is someone out there that do not want to meet them. How do you spot these terrorists? You can recognize these people by their battle cry, “My dog is friendly!” Henceforth known as My Dog is Friendly (MDIF™). A DINOS is working on his manners, let’s say it’s leash reactivity. He has some issues with strange dogs, but is in training so that he can learn to stay calm in their presence. DINOS spots another dog coming and, like their trainer instructed them, they create some distance and do a sit-stay with eye contact. The goal: to keep cool while the other dog passes. But they didn’t realize they were being stalked by an eager MDIF. Look! There’s one now, crossing the street, speed walking in a beeline right towards the seated DINOS, their own dog straining at the collar. The DINOS steps further away, trying again to create distance. Any anthropologists (or kindergartner) can read the clear body language in play from DINOS. Observe: no eye contact or smiling, they are facing away from MDIF, perhaps glancing frantically around themselves, looking for an escape. And, without fail, MDIF calls out their cheerful, pleading battle cry, “My dog is friendly!” Usually this is received by the back of the DINOS as they jog away. The DINO, shaken, wonders why they are working so hard on improving their dog’s manners when the humans around them have the social skills of, well, a dog with no social skills. Quickly, let’s turn to the similar epidemic of off leash dogs that are not under voice control. It’s the law: Put your dog on a leash. No one but ME gets to decide who my dog interacts with. Not you, with the “friendly” dog who just wants to say “hi” or you, with the dog who “knows” not to leave your property, but charges me up my porch steps. I, and I alone, will decide if my dog will be interacting with your dog and when you let your dog run loose you are ROBBING ME of my right to choose whether or not we want to interact with your dog. Not cool. Dogs In Need Of Space are good dogs. 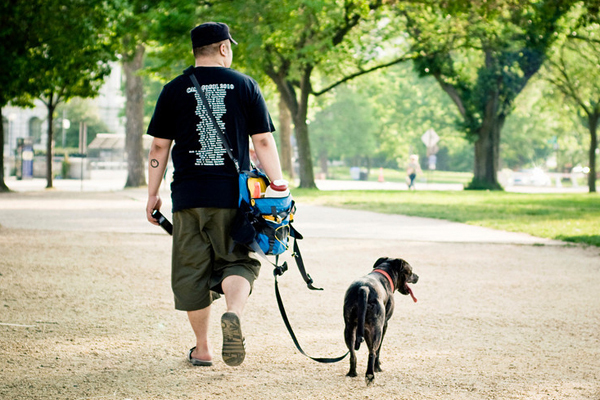 They may not want to socialize with your dog, but they have the right to walk with their owners, on leash, without harassment from strangers who insist on a forced greeting. Their owners do not want to cause a scene or yell, in a panic, at strangers. They don’t want their dog to act inappropriately, get hurt, backslide on their training, or frighten anyone. Please, dog lovers of the world, allow these dogs and their people some space and, if they are walking or turning away from you, keep your dog close by and pass them without comment. Food for thought for sure – every dog companion needs to read this. @JoeyL haha, thanks Joey, we know those people too. @JoeyL You bring up a most excellent topic. Those people drive….me……crazy. I get so angry when people either (literally) run screaming towards you “PUUUPPYYYYYYY” and jump on your dog or let go of their kid and let their kids tackle them. The dogs love it, I…hate it. And I do put them in check, they should be told! That is just not ok, my dogs are friendly but you don’t know that!! Great article. My Rosie has been lunged at by more “friendly” dogs that I’d like to remember. I don’t know your dog’s temperament or vaccination history, so I’d rather just smile, wave and keep moving. My pet peeve on walks are the people with the reel-type leashes who are walking along oblivious to the fact that their dog is 30 feet away from them doing whatever it wants to do. @flynnesmom Ugh, yes, we know those people too. Those ‘leashes’ are dangerous. Thank you for this great PSA! My sweet boy is still working on overcoming his fear of the unknown (people and dogs), and the LAST thing he needs is to be accosted by what he fears the most – random people and their dogs! This is the one instance that peoples’ fear of APBTs and ASTs works in our favor, as people are usually more hesitant to approach a dog of this breed! What they (luckily) don’t realize is that he’s more afraid of them than they are of him! @MelanieAWright The worst part about training our Stranger Danger dogs is the fact that although they’re visibly uncomfortable, they try so hard to keep their cool and its always somebody else that ruins it. It MUST be the pitbull’s fault – not the MDIF’s who can’t communicate effectively! My pup has several of these issues! She’s a shy little girl, scared of kids, AND she’s been dealing with TWO TPLO surgeries over the past six months. However, she’s also very sweet and very friendly so I’m quick to let people know. I either blurb out “she’s friendly but recovering from surgery!” or “she’s friendly but please keep your young child away!” The surgery one tends to be much more effective (people are sympathetic) but I still struggle to convey to people that my pup needs some space- even though sometimes she doesn’t know it. Unfortunately, I think the people that read your PSA are naturally going to be the more considerate ones. Still, I’ll repost in hopes that someone is listening. I do the side block. Whatever side the person(s) approaching from, I move my dogs to the opposite and stand between strangers n pups. I will introduce myself then tell them my dogs can approve the intro one at a time. To them, I am keeping my dogs in check…but really it’s just my passive-aggressive way of saying back the heck up and ask permission before you touch my dogs. I find myself having to be firmer and firmer with my own friends and acquaintances who come to my home. When I say, “we like to wait until she has calmed down before she gets to get attention from visitors,” more often than not I have to follow up with, “PLEASE don’t touch her until she is calm.” Sometimes I have to resort to, “you know what? I say when she’s calm, not you.” I’m starting to weed out the people I invite over at all. We have a crazy lady in our neighborhood (large city, heavily dog populated area) who just does not understand how to train a dog. The 40lb dog walks her! The most annoying part is she does not respect the “potty lawn” (my highrise has two large grass areas, one is an informal dog park and the smaller one is what many residents use as the housetraining area). My 1 yr old pittie is very dog social, but she knows that the “potty lawn” is not for play. Other dog owners recognize the look of an owner waiting for a dog to potty and keep their distance – or respect the space that I create. But not this lady, she let her dog “stalk” my dog for the entire time we were out last night. She even let her dog run up behind us and try to interact with my pup before we had time to react. I finally snapped at her “this is NOT playtime!! !”…of course she kept saying “sorry” everytime her dog got close – but lady learn some basic training, she is putting herself and her dog at risk for sneaking up on the wrong dog!! Great article my feelings exactly. My Fiona does not like dogs in her face at all even though she was socialized since she was a young……she just doesn’t like it! I respect that and always make sure when other people want to approach with their dogs I indicate that. I have had a response of “oh my dog just wants to say hello” – and I have to respond well she doesn’t! When we are walking and someone has their dog all over the path I ask them to pull their dog in because……….Fiona doesn’t like dogs in her face…I can’t count how many times these people still don’t pull their dogs in…sometimes I wonder if they are hard of hearing! Oh Fiona is one of three dogs I am walking! While I understand the underlying issue here, this article certainly does make friendly, likely uninformed people look like mean, evil ogres. I understand the need to explain the situation, and I know more now having read the article, but is it really necessary to make friendly dog owners out to be horrific monsters who want nothing more than to stalk you down with malice in their hearts? This might not be the best way to bring the subject up to the average person and get a good reaction. @[email protected] If this article is only meant for comedy for owners of Dogs Who Need Space, then I can see the humor 🙂 I thought it was to help others understand Dogs Who Need Space, in which it comes off as rather mean. Sorry if I took it the wrong way! @JessDolce I can certainly understand wanting to blow off steam, especially about things that can get rather annoying! I tend to do the same with Religions that chase me around trying to convert me, and at least they aren’t *physically* chasing me! Thanks for responding, and being polite about it 🙂 That goes for the other responders as well! Speaking solely for myself, I have little patience with the idea that the expectation that dog owners/handlers not let their dogs run up to strange dogs/people is somehow antisocial. If you choose to be a dog owner or handler, it’s your job to educate yourself about dog behaviour and control your dog. It’s common courtesy – you’re not being a friendly dog owner if you put your dog in the position where it either causes harm or is harmed by another animal. I don’t think it is anyone’s intention to suggest any evil intent from anyone – we just think that people should think before they make this kind of mistake. The author has put the problem in a humorous light and if the “offenders” just took it that way, there would not be any hard feelings. This is so true. And My dog IS friendly but we never charge anyone else without asking them first if they WANT to say hi. Leash laws are in place for a reason! Abide by them people!!! Thanks as always for the wonderful message! I just want to add that this should be taken in the nature it was written. It brings a light humor to a serious message. Its not meant to make MDIF’s sound crazy but also to give props to the DINOS that are doing the right thing…its just a light way to send a serious note…. as the owner of a rottweiler (who loves other dogs but does NOT like joggers, or unpredictable people… which might include kids but i don’t want to find out!) i don’t deal with this because dog owners tend to avoid my dog. they just assume “aggressive.” better for me! MY bigger problem is people who use designated and clearly marked off-leash areas for their recreational activities, completely indifferent to how these behaviors are interpreted to the dogs who are legally allowed to run and play leash-free there (and just about nowhere else in the city!). this includes joggers, bikers, screaming kids, screaming kids waving food (! ), people practicing martial arts (!!) etc. these are the same people who will sue you when your dog lunges at them, and never question how their actions contributed to provoking a generally friendly, happy, family pet. this can cost dog owners their home insurance, not to mention mean negative consequences for the dog (let’s not get into those!). overall, i believe that people do not respect dogs’ space. they feel free to do as they please and if something doesn’t suit them, go after the dog and dog owner they believe is blameworthy. this is something i contend with every day. kudos to the writer for opening the discussion. @rach555 You’re welcome, and now you see that you are not alone, in fact, there are many like you and your dog. When others approach I have my dogs get behind me. Basically I’m body blocking the other person or dog(s). I don’t know them; I don’t know their dog(s). I don’t know what they intend to do. I have gotten good at saying in a commanding tone of voice, “No, you (your dog) may not meet my dog(s) without my permission.” I feel I am teaching good dog safety techniques. I call the shots, I make the rules. If you obey me, you may get to interact with my dog(s) on my terms. If they think I’m weird or mean, I don’t really care. My dogs and I are safe. If I think they are the type that are not going to listen to me, I slip my walking stick from my backpack into my hand (it’s easily accessed) and try to look fierce (not easy) as I make sure they [their dog(s)] cannot get to my dog(s). My commanding voice and fierce expression are getting better. Most people respect me and we have become good friends. We have wonderful calm interactions that are appropriate for each dog. Either that or they now leave us totally alone. Yeah! if i had adopted this mantra earlier, i would have avoided problems. for so long i was so hung up on “proving” that rottweilers such as mine are friendly, awesome dogs that i didn’t put my own dog’s safety first. i would let anyone approach him, i’d let him off-leash anywhere i could, i tied him up, i let kids get right up on him, etc etc. only after some rude awakenings about how other people act/react did i realize that if my dog acts even the slightest bit put-off by off-putting behavior, he and i will face the consequences and NOT the perpetrator. now (after 4 years of trial with a fair bit of error) i don’t care what people think. i just simply cross the street if i see kids, strollers, bikes, runners, dogs, construction sites, it doesn’t matter – anything that even poses the potential for the teeniest tiniest trouble, i avoid. if i seem rude or they assume he’s vicious, i don’t care. let them think whatever they want. my dog comes first. it was a surprisingly hard lesson to learn! A good story to illustrate: We were camping. I was walking my dogs along the road in front of the other campsites, when suddenly a little boy, probably 3 years old, came running at us, yelling “Doggie.” I put out my hand and shouted, “Stop! You may not pet my dogs! They are cleaner than you are!” He was completely covered with spaghetti sauce. The next day we were walking the same way when again the little boy came running and this time he was shouting, “I’m clean, I’m clean!” I put out my hand and shouted, “Stop! You have to go ask your Mom if you can pet my dogs (I could see her smiling).” He turned and ran back to her. She gave him permission. He came running back and I shouted, “Stop! Now you have to ask me.” He stopped at a distance and said, “Can I pet your dogs?” I said, “Yes, but you have to walk up slowly, let them smell your hand, and you have to talk to them quietly. You must always use gentle, kind hands.” He did exactly what I said and we had a wonderful time visiting on my terms. What a great teaching opportunity! @sweetpea that is great! i have definitely learned my lessons. a few months ago we were walking carefully through a park and i could feel the energy of someone running up on us. i turned around and there was a little boy who asked, rather politely, if he could pet my dog. i said no – it was a gut reaction since he had RAN up to us, i didn’t trust he would know how to approach my dog physically, and i didn’t have time to do a tutorial. as i walked away, i could see the kid in the distance looking sad and shell-shocked and i felt bad. but not as bad i would have felt if the kid lunged at my dog, my dog lunged back, his mother appeared out of the woodwork, animal services showed up and dealt with my dog, then a lawyer contacted me because “the child was traumatized”. no thanks! side note: where are these parents when their children are running and lunging at strange dogs??!! The parents are trusting us, complete strangers, to keep their treasure safe. I don’t understand it! Since our country changed from our more agrarian roots, people are no longer able to undersand how to read animal body language, nor do they know how to behave safely around them. The amazing thing is many people think it’s someone else’s job to keep them safe. Self reliance and self preservation has been lost by many. How often do you see individuals walking down a road with their backs to the oncoming traffic? They don’t even look back when a car approaches. They are clueless, irresponsible, and appear to be daring someone to run over them. Society is changing but not for the better. Dog owners and especially, Pitty owners, and owners of other strong breeds, need to be responsible for themselves and everyone else. Sometimes our responsible behavior seems mean to the irresponsible public. We’re just being safe. I have the problem with people calling my dog while I’m walking him. I’ve had him for a month (he is about a year old) and on every walk, EVERY walk…someone calls out to him “here puppy”…etc. This is a good article except for one thing: I fail to see how calling, “My dog is friendly!” is wrong or an indication of clueless terrorism. Letting owners know ahead of time that your dog is friendly is a GOOD thing to do. There are a lot of people who happily assume pit bulls are evil if you don’t let them know otherwise. Many times, if I hadn’t made my initial declaration of my dog(s) being friendly, a small dog owner wouldn’t have ever thought to stand still long enough to let our dogs meet and prove that their dog loooved my pit bull! Sometimes they say, “Oh, but mine isn’t,” or “That’s good, but we’re training,” or even wordlessly just stand to the side, and in those instances I rein my dog(s) in and let them have their space with nothing more than, “Have a nice day!”I don’t think I’m being a terrorist by giving them some information and then respecting the boundaries they set. @JessDolce @plunderpuss Thank you. I AM aware I’m not a douchebag 😉 haha I’m just saying that personally, I’d rather the phrase being scorned was something that would seldom be uttered by responsible owners. Pit bull owners should be encouraged to use this phrase if applicable, so why turn it into an acronym for ignorant people? Anyway, you’re the article-writer, not me–I’m just some Internet jackass. It just might be worth thinking about where you apply pressure. Ironically, follow this link to a current article of a complete accident after giving permission! What I don’t understand is why the “petter” would let this proceed so far! It was an accident!!! Holy cow — thought I was the only one to have experienced behavior! Such a humorous way to look at what can be a thoroughly frustrating experience. @barbaraleeanderson07090 No Barbara, you are indeed not alone. There are many DINOS out there.